Protesters took to Michigan Avenue to demand accountability from the city and disrupt Christmas Eve shopping. CHICAGO (WLS) -- Protesters marched on Michigan Avenue calling for Chicago Mayor Rahm Emanuel and Cook County State's Attorney Anita Alvarez to resign. The protest was mostly peaceful throughout, and acccording to police there only two arrests were made: a 19-year-old man charged with disorderly conduct and failure to obey police, and a 22-year-old man charged with battery and failure to obey police. 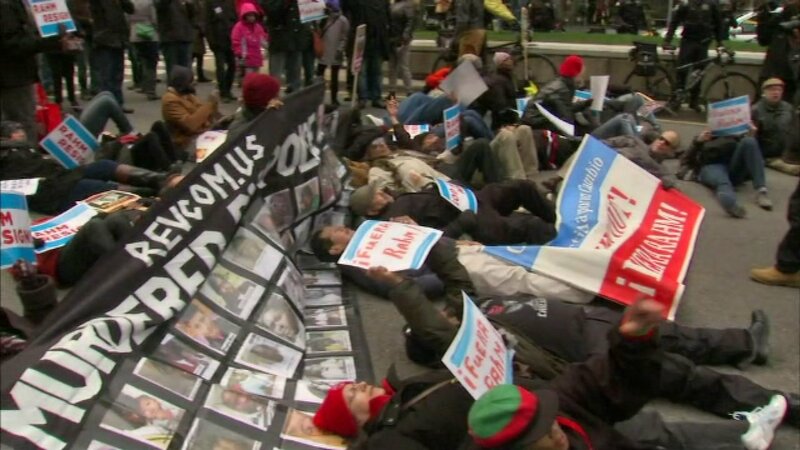 Protesters aimed to disrupt Christmas Eve shopping along the Magnificent Mile Thursday afternoon. Marchers called for the resignation of Mayor Rahm Emanuel. Organizers called the protest "Black Christmas," and their route and presence on the stretch of stores along Michigan Avenue on a busy shopping day. The crowd of demonstrators didn't grow as large as some were expecting, but they did manage to block some shoppers from entering several stores. This was the latest protest following the release of the Laquan McDonald police shooting video. Most demonstrators held posters demanding Mayor Rahm Emanuel resign. "The people are all committed here," the Rev. Gregory Livingston, Coalition for a New Chicago, said. "They want to see change. They came here to see change." Coalition for a New Chicago wants an economic boycott of Michigan Avenue retailers. The protest began at 12 p.m. Thursday at Michigan and Wacker. From there, protesters walked north on Michigan Avenue, sometimes stopping to lie down in the street. As of 2 p.m. protesters blocked Michigan Avenue at Oak Street. Police rerouted some traffic at Lake Shore Drive. At intersections, protesters lay down in the street as they staged die-ins. It was quite a sight for many people doing last-minute Christmas shopping. "It's an interesting time of the year to do it," said Marvin Gentry. "If you need to get attention it's a good thing to do." "They have a right to protest. I won't be here. I'll be out of the way," Tiffany Jackson said. At several points during the march protesters blocked off entrances to popular stores like the Apple Store and clothing store H&M, which they stood in front of with arms linekd. Coalition for a New Chicago hoped for a turnout like the Black Friday demonstrations in which hundreds of demonstrators took over the shopping district, blocking entrances to some stores and shutting down the street. The demonstration largely dispersed around 2:30 p.m. with only a small group of protesters remaining.